As someone who refuses to pay full price on anything approximately 97.4% of the time, I wanted to share some amazing sales with you on handbags, accessories and clothes – for yourself, or for a little early Christmas shopping (for yourself). Here we go! Yes I’m serious. Online. Sample sale. Hurry. I used to elbow hoes at the in-store sample sale. jk I’m timid and afraid of confrontation. Remember my Amorous Satchel from my “what’s in my bag” post? Well it’s on sale right now. 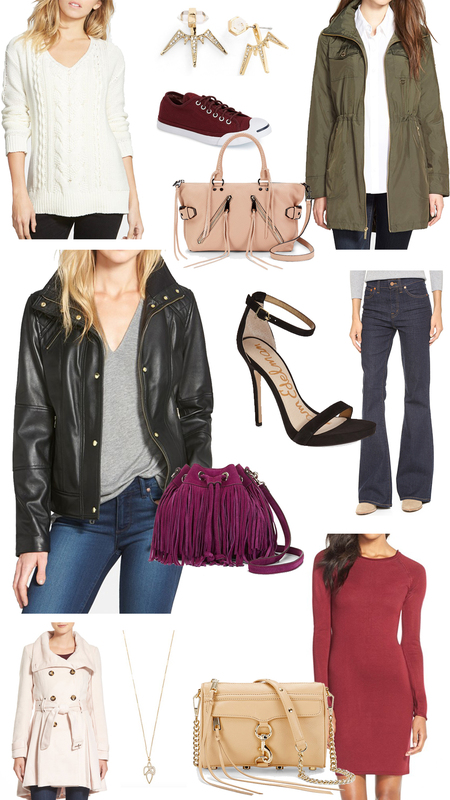 A few other swoon-worthy sale finds on my wishlist: the Chanel Boy Bag dupe (at literally 3% of the price): the Love Crossbody; this amazing Fringe Bucket Bag in a beautiful wine color, or my go to – the Mini MAC, which has been my handbag staple for years. Also obsessed with this Moto Satchel… but I think I want the mini one 🙊… check out the rest of the sale here! A few things I’ve had my eye on for a while: these Rebecca Minkoff ear jackets (brand loyalist for sure), and this burgundy bodycon dress… we all know how much I love burgundy. Super obsessed with these burgundy Converse, too, which are a great price. And this cream colored sweater from BP. is timeless, and cheap af. MUST HAVE dress shoes: these sandals from Sam Edelman. SUCH a good price, and I promise, these shoes are a classic style that will go with everything – casual and dressy. They don’t have any left in my size and I’m crying. In terms of outerwear must-haves, I have to recommend a simple but stylish anorak from Michael Kors, or this lighter one from Levi’s. I’m also dying over this blush coat from Steve Madden – how beautiful is that color? A very California “I’m pretending it’s cold” option is this sweater that reminds me of a Mexican blanket. Just imagine getting to walk around all day in a sweater that is basically a blanket! For activewear, I LOVE this gorgeous lavender color on these Zella crops, and my favorite Nike Frees – the Flyknit 4.0 (that you’ve seen in MANY of my posts) are on mega sale (40% off!) in this pink color here. Woooo! They literally feel like socks with soles. It is glorious. If you want my color specifically (turquoise) they’re on sale for $99 (from $120) here. I’m obsessing over my Madewell Flares (that you shall see in the next outfit post, coming v soon); they’re $40 off right now! It’s a steal for the quality – I love Madewell denim, the fit is always flawless. And if you’re looking for a simple gold necklace, this one from Sam Edelman is 50% off.